For long-lasting beauty and functionality, self-leveling concrete overlays make an ideal solution for your home, office, restaurant or hotel. 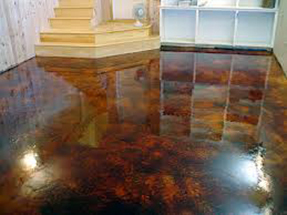 With an unlimited number of designer colors and options to express your unique sense of style and creativity, these concrete coatings will take your boring concrete floors to an functioning work of art. Decorative concrete coatings are often mistaken for natural stone and tile, but they are much more affordable and easier to maintain. 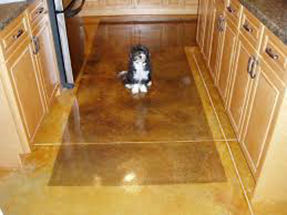 Our concrete polishing experts offer flooring surfaces with light matte textured or high-gloss polished finishes. 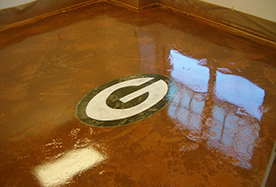 We use only premium-quality epoxy coatings and concrete finishes to increase your floor’s longevity. When you need a solution for uneven, damaged or poor draining floors, self-leveling concrete provides an affordable flooring alternative. This technique allows for correcting height discrepanices between hardwood or tile floors, and it even adjusts height issues at doorways. Our professional team will lay concrete in layers from ¼ to 1 inch thick to bring them level. Concrete overlays come in white or gray with the ability to color or dye in a variety of multiple color patterns or single tones, whichever you prefer. You may also have our team work the concrete into the appearance of tile or pavers with precision saw cuts. Some of our clients choose to combine these saw cuts with colored glass, exposed aggregates or other color variation patterns. We then grind, polish & seal the finished floor. 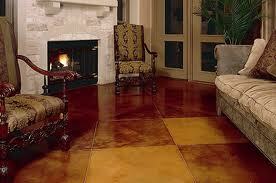 An extra coat of protective sealant adds lasting beauty and requires minimal maintenance. We offer interior & exterior decorative concrete overlays to suit your budget and project.